Scientists have shown that male Siamese fighting fish, Betta splendens, increase the frequency at which they breathe atmospheric air during aggressive interactions. 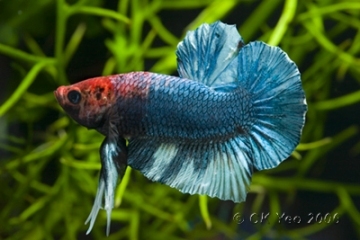 Betta species are members of the suborder Anabantoidei and possess an accessory breathing organ known as the labyrinth. So-called due to its maze-like structure this organ allows the fish to breathe atmospheric air to a certain extent. Under normal circumstances most of the oxygen required by the fish is taken from the surrounding water via the gills. However, during aggressive territorial encounters between rival males the combatants engage in fin and opercular flaring behaviour, the intensity of which leads to a significant increase in oxygen uptake, and the new research demonstrates that this is obtained almost entirely from the air with no significant increase in aquatic oxygen uptake. “It seems their smaller gills, a result of living in low oxygenated water, cannot keep up with the vigour of the fight, and more air breathing is required,” Dr Steven Portugal from the Royal Veterinary College told the BBC. Opercular flaring also inhibits pumping of water over the gills due to the gill plates being held in a rigid position, and the fish thus obtain most of the additional oxygen by increasing the frequency at which they rise to the surface to gulp air. Such events not only interrupt display behaviour and increase the probability of losing an encounter, however, but also increase the risk of predation, and male fighting fish have solved these problems by engaging in simultaneous air-breathing, with one leading the other to the surface and both taking a breath of air at the same time. 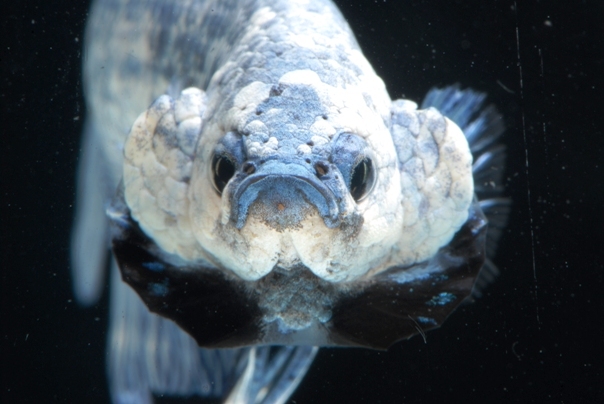 “Synchronous air-breathing in fish is typically an anti-predator defence mechanism,” said Dr Portugal. “It seems their smaller gills, a result of living in low oxygenated water…”. I made the point on the BBC Nature page that this was a possibly incorrect statement, if the gills are relatively small (and I’ve not seen anything that says they are) then it is more likely that this is due to the space taken up by the labyrinth, which is an adaptation to, not a result of, their habitat. Hm can’t remember ever reading about Betta having reduced gills either. The labyrinth is located above them isn’t it? Yep, so there _may_ be a trade-off of somewhat reduced gill size (although I’m not aware of any figures on what gill size would be expected for a given fish size, especially as it would vary so greatly, you’d have to factor in trophic, behavioural and reproductive ecology for each species just for starters) against the labyrinth organ allowing activity when DO is too low for branchial respiration to be effective, or of permitting reproductive behaviour when DO is too low for potential nest predators to be active (or various other possibilities along the same theme), but it is still an adaptation to habitat, not a result of. “It seems their smaller gills, a result of living in low oxygenated water…” Sounds like an incorrect statement to me as if they lived in low oxygenated water then surely their gills would be larger to let as much oxygen into their body as possible! Simple science.